Mike Mann's new sea level hockey stick | Watts Up With That? Tomorrow at 15:00 EST an embargo will be lifted for a new paper to be published in the Proceedings of the National Academy of Sciences. I have a copy, given to me by a media colleague and I intend to honor the embargo for the paper (which is open access and we’ll be able to read it in entirety) as well as the press release that accompanies it. However, I can safely announce the existence of the paper, since Dr. Mann has already effectively broken the embargo by advertising the existence of the paper on his own website in his curriculum vitae (CV). While I can’t say anything about the contents of the paper or the press release, I can tell you that very little has changed in the pursuit of the hockey stick. I’ll have the full report tomorrow when the PNAS embargo is lifted at 1500EST. Quick! The DSM-5 is still being prepared, they might want to add an entry regarding “Hockeystickmania”. Let me guess the conclusion: models show catastophic sea level rise in the near term…more research required. My home is about 120 feet above sea level. Without giving anything away, Anthony, can you please advise whether putting it on the market first thing in the morning would be a smart move. I was under the impression we have been told repeatedly we need to trust Scientists. So what IS Michael Mann? A statistician? A physicist? If there all MM is doing is measuring things and running stats on it, I would assume there are people in the world who have better credentials to do the statistics, like, say, a statistician. All this “Trust the scientists” is very confusing, if what the “scientists” are doing is playing at being statisticians. Hopefully there will be some link to Dr. Mann’s area of study in physics, Geophysics, Geology, or applied math (I suppose there is some statistics in applied math). Going by Mann’s reputation and past practice, I suspect that his conclusion will be something like this, instead of the latest satellite data. Help! We’re all going to drown. Or more likely die of massive head trauma brought on by smashing our heads into walls from listening to crap. >Quick! The DSM-5 is still being prepared, they might want to add an entry regarding “Hockeystickmania”. …prolly in honour of Obama. Mann doesn’t take measurements. He takes other researchers’ data and mines it using “novel” and “new” methods. Or as an objective observer is likely to conclude, he tortures it until it confesses. I think some of the commenters here, such as Anything Is Possible are missing the likely point of the new study. It will simply be a reinforcement that the current conditions are unprecendentatively worse than ever, and that the Vikings were only able to colonize Greenland because they possessed fusion power and environmental suits given to them by extraterrestrials who subsequently took back their technology, destroyed all records of it, and mindwiped the Vikings who survived. Jeez: Thanks. Understood Mann either obtains or perhaps funds the data acquisition from his grants. I’m trying to understand if what he is doing is using statistical analysis on the data, why is he the best to do it? Does he have some great insight into statistics? Didn’t see it on his CV. Also, I have understood he made some goofs in his use of statistics in his last hockey stick graph, discovered by Steve McIntyre and friends, and further represented the data in ways some have called not “clear.” I’m thinking it might be better for someone who is an expert (or perhaps Mann is an expert), perform the statistical calculations. “he tortures it until is confesses” . . .Love that. It’s ironic in many ways, at least to me. previous investigators have confused the temporary with the permanent. Must be bristlecone wave core proxies. 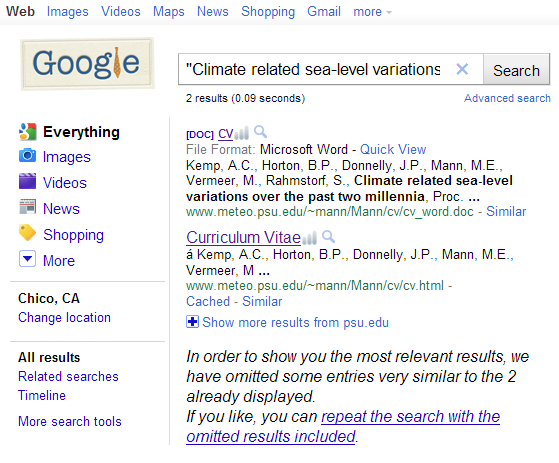 It seems undeniable that there will be Mann-made sea level rise. I can’t be certain. Was Mann in Vancouver on Thursday night? Hopefully “jumped the shark” will be the final description of it, given that his ridiculous hurricane hockey stick didn’t get much public ridicule despite withheld proxy data and being yet another example of stapling on a dubious instrumental-record blade likely biased by greater detection over the years onto a random walk trend-less proxy-based handle (see: http://climateaudit.org/2009/08/12/more-check-kiting-at-nature/). I got screamed at on an AGW enthusiast site, told I should be ashamed of myself, that I was stupid, that I didn’t really have a Ph.D., that blah blah blah…for posting a chart of representative tide gauge records (http://oi53.tinypic.com/2i6os4y.jpg). However, the one valid point was a lack of publishing my collection in the literature. Well, I thought, let’s dig a few sea level studies up then. Imagine my surprise to not find just linear trends but universal signs of recent deceleration! (1) Church and White, the classic purveyors of an exponentially shaped sea level curve, in their latest article update of 2011 (which eliminated the word “accelerating” from the title) plots, in hard-to-see yellow, a simple average of tide gauges, which, once I clean all the dark plots behind it away, shows stark linearity. (8) A study by one of the RealClimate team (Rahmstorf 2007 as discussed on http://climatesanity.wordpress.com/). He got his acceleration via adjustment to *actual* sea levels to account for land based water reservoirs while ignoring ground water pumping to the surface. This swam right through peer review. Such adjustments are highly speculative at best and simply fantasy at worst for they do not reflect *actual* sea level changes! I gave it a good try with the Univ of Illinois search system & didn’t find squat, Anthony, so it ain’t out there yet. Rather bad form to post a publication to your resume before it is published, I’d say. Happy Father’s Day, by the way! 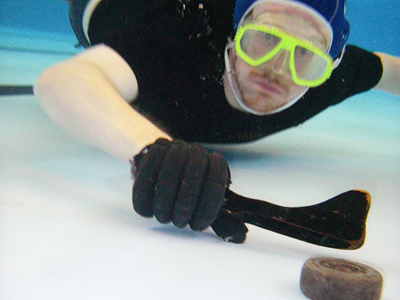 The pic @ the top is from a game of UNDERWATER HOCKEY, you need to be able to HOLD YOUR BREATH for long periods…but I will not be holding my breath for any MAN MADE MIRACLE from MANN. We have over 90% of the worlds ice stored down below us…..its called ANTARCTICA…..and it is a VERY COLD PLACE….even on a warm day….take it from me that ice is NOT GOING ANYWHERE…..In fact the volume of ice in ANTARCTICA has & is INCREASING. Yes sell it right away at any price you can get it will be worthless the day after tomorrow ( that would be a great title for a movie). I’ll offer you $15. That is more than it will be worth. I broke my hockey stick this winter playing puck. I think I’ll send it to Mann, but I can’t find the blade anymore….but i’m sure he can carbon date it still…. Sounds like Mann might be up to the old “trick” … splice together data from different sources (tide gauges and satellites) to get a sudden and “alarming” change. It’s a sad indictment of “climate science” that we know that this will be a load of garbage before we even read it. Nah, protesting and causing a disturbance seems more up James Hansen’s alley. Jimmy Haigh says: June 19, 2011 at 8:20 pm It’s a sad indictment of “climate science” that we know that this will be a load of garbage before we even read it. Jimmy, don’t you think that this statement is non-scientific and uncomfortably like statements we hear against us? I understand passion, but it does not have to be on a science blog in so bare a form, does it? To be fair, we don’t “know” that at all. I don’t mean to be offensive, but I assume you don’t realise that formatting your post like that – particularly the CAPS – makes it look like the work of a loony. I thought someone should tell you. Let me guess, we are all going to drown very soon according to the models, even though there has been a levelling off and slight decline in sea levels. Very soon the seas will start to rise again but much much faster than previously thought according to the models. Unless we destroy our industrial Western economies and borrow more trillions and lavish more money on certain ‘scientists’ of course, in which the models predict all will be well and we will all be happy and gay and the world will join hands and be one, according to the models which are never wrong and must not be questioned. In the world of Mann made global warming, the future can be divined not by visiting the Delphic priests and giving them gifts of gold, but by accessing the new oracles of models by way of the new priesthood of climate scientists. Nothing much changes does it? New oracle different priests, same fiscal incentives with the same outcome, you gets what you pays for. Repent sinners or doom will befall you, BTW please supply more money or doom will befall you soon. His words on the “Hide The Decline” deception are very strong. As Mann has already been ridiculed about his Hockey Stick GW/CC/GWD/AGW nonsense, does he really expect even dumb non scientists to believe his latest manipulation of data? How conceited can he get? Also who are the idiots prepared to fund grants for this kind of charade? isn’t breaking one’s own embargo akin to self-plagiarism? Where’s a DeepClimate when one is needed? Have also posted at ClimateAudit.. Looking at the latest global temperature charts, I think we need an inverted hockey stick graph. Imagine If the biologists would be dissing Darwin, that would be similar to what is happening i the field of sea level studies. Same strict review process as Lindzen’s paper I presume…. When does he release the data and code, Anthony? A real cynic might wonder whether the recent inept attempts by the Rocky Mountains Sea Level Centre to pull the wool over our collective eyes has any connection with the publication of this paper? They really must think that we are all a bunch of morons. Thanks for all those links and research. Very interesting. They really are full of their own BS, aren’t they? Nevket240 – nice graph on the link. But it made me think – that is a very linear trend since the seventies. But coal/oil/gas burning has been increasing at a very non-linear rate. Why? In the web site for his CV, he can’t even spell pseudo correctly. On the bright side, on his home page I did find this delightful cartoon which shows a refreshing viewpoint that “the opposition” should adopt. Would it really be that bad if they used it for a starting point in their research? Although there are many other versions! I guess tree ring data show an unprecedented sea level rise for the last 3 decades. Let’s say the ocean basins were shrinking. Would he have reduced the rate of sea level rise to compensate? I just know, that the word “unprecedented” will feature prominently in that paper. The author A. Kemp dealt with an unprecedented sea rise at North Carolina only, but in the fresh-out-of-oven paper he does that worldwide, apparently. New oracle different priests, same fiscal incentives with the same outcome, you gets what you pays for. You made me realize, happy models are obviously much more expensive than pessimistic models. Do scientists ever play a game amongst themselves where you choose a ridiculously wrong conclusion and then gather evidence to support the claim? For instance say you had a conclusion that Lions should be classified with Dogs than Tigers. You could then work out all the reasons for reinforcing this wrong conclusion; Lions hunt in packs which is unknown amongst other cats, and is a dog-like behaviour. I thought it might be a fun thing to start a thread with a conclusion and ask all your contributers to show how easy it is to make the science fit the conclusion. I am sure it has been done many tiomes before, not least by M Mann. Academia has always been deeply corrupted by politics. The triumph of truth will not come fast, internet and blogs like these one will finally defeat the corrupt mainstream academia and will bring out the truth but I think that the process of bringing deserved discredit to corrupt -often financed by taxes- academia will take several more years, even decades. Whether to be included in the DSM-V? Accurate observation there jeez. Your comment is evidenced in the released CG emails, the narrative of the data collectors. And their questioning. In the meatime the rate of sea level rise has decelerated over the last 80 years. Currenlty it’s flattening. Why do people persits in seeing demons where they don’t exist? I am not sure to that question. But studies by behavioural-economists have pondered on your very question for some years. It takes more than a box full of hockey sticks to win The Cup. Look on the bright side . . . your property value will go way up when you are a waterfront property. Too bad the satellite data doesn’t show a hockey stick. That might have meaning if it did. In fact it might be meaningful if the satellite data showed any trace of global warming. For Mann it is really too bad that it doesn’t. That must be a nice season up there in the north? Absence of Brigette B and the all the other celebrities visiting for a few icy months must be a huge relief? In my previous post I meant that I it will take several years, perhaps decades until internet and blogs like this one bring a widely accepted -and fully deserved- discredit to the corrupt mainstream academia and media. Be on the lookout for tide gauge data that stops ~2002. Just sayin’. Just read the paper and his data only goes through 2000 and his hockey stick makes a guest appearance. Guess he hasn’t seen (certainly doesn’t care to mention anyway) the flattening/stabilizing sea level measurements. Apparently Mann couldn’t wait until 3 pm Eastern Standard Time to throw his latest pal reviewed paper against the wall to see if it sticks. It doesn’t. As usual, Mann’s graphs show lots of hockey sticks, and erase most of the MWP and the LIA. He ignores contrary evidence, such as the fact that a warming planet would cause thermal expansion of the oceans and thus an accelerating sea level rise, when just the opposite is occurring. This latest Mann paper is more CAGW propaganda, just like the debunked MBH98 and Mann 08 were. His conclusions are based on a fantastic and easily refuted conjecture, not on verifiable evidence. I look forward to Steve McIntyre’s deconstruction. I find it interesting that Mann is being so fastidious about keeping his CV up-to-date. I heard that next year CSU are going to introduce a correction to sea level for the growing sea mounts in the Hawaiian chain and elsewhere that are reducing the volume of the oceans. Your link is to the wrong paper. It points at a review entitled “Climate Over the Past Two Millennia”, from 2006.
didn’t tamp down him and the rest of the team furiously CALCULATING DOOMSDAY with it. Wow. I guess Mann’s just born to cypher. I think he was born to get indicted, myself. Typically when these loons run amok in a government, the people who finally bring them down, start charging them with different things, making them prove what they say is even LIKELY. In a civil case, sheer preponderance of evidence is all that’s needed. and you have him continuing to try to get money for it, his college degrees make him without any excuse that he knew, or should have, that his mathematics are not giving accurate statistical results. Civil suits against these people are the answer. Make them prove every single word they say by a preponderance of evidence: not even a 90% likelihood. For instance have him simply prove in court that pink noise doesn’t produce hockey sticks. If he can’t, after he’s been told, then he’s liable for various torts. If it weren’t for the fact that they serve a useful purpose for those advancing a radical environmental agenda, we would pay no attention to them. At least the astrophysicists give us really cool pictures. How can the listing of a new paper[clearly noted as “in press”],without providing access to the papers’ content, be regarded as “breaking the embargo” on the release of the paper? I can’t wait to see Dr. Mann’s next attempt at a FrankenGraph (ie: cobbling together two unrelated, unreliable proxies to fabricate a chilling Hockey Stick tale, like Mary Bysshe Shelley sewing the hands of a violinist onto the arms of a Blacksmith).